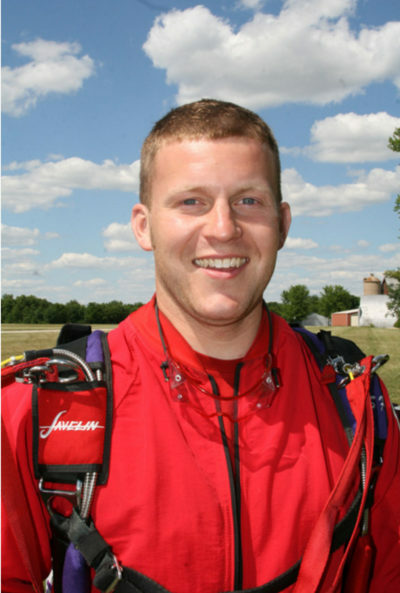 Chris is our Fort Atkinson native and has 2,400+ jumps under his belt. When he’s not skydiving you can find him out mowing the dropzone landing areas. He loves to cook, travel, adventure, try new things, and always enjoys everything life has to offer. He also would like to thank God for being able to be part of such a beautiful, amazing sport. 1.) What attracted you to the sport of skydiving? 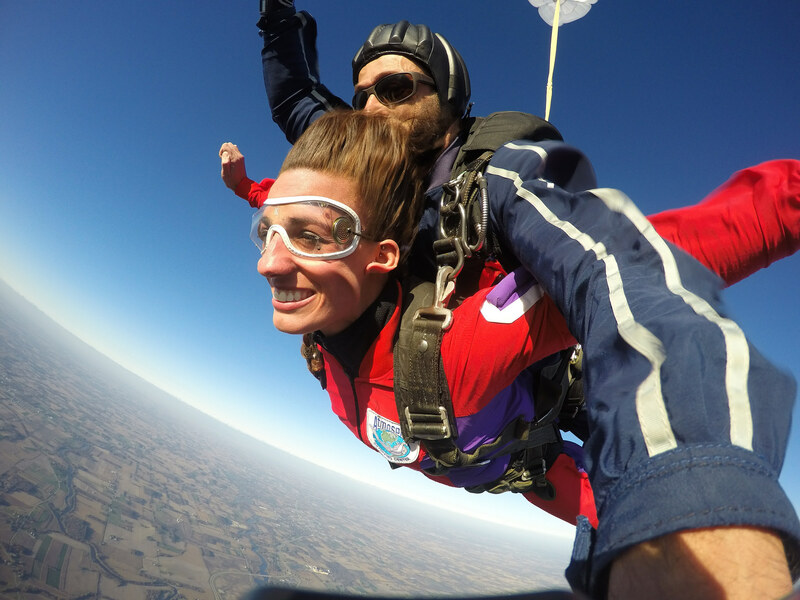 It’s a funny story – I had no initial interest in skydiving and was unaware of Wisconsin Skydiving Center’s existence at the Fort Atkinson Municipal airport. What’s funny about it is that I was only 14 years old and would ride my bike from Fort Atkinson to the airport to fulfill my interest in airplanes and flying. It was shortly thereafter that I discovered the skydiving operation. They (skydivers) would walk across the landing area and load the planes near the fuel tanks where I would watch. Being the shy 14-year old that I was, I always kept my distance. One day Bo came over and invited me to the hangar to look around and check things out. From that point on I began riding out on a more regular basis. I then learned to pack parachutes and saved up enough money to do my first tandem skydive. 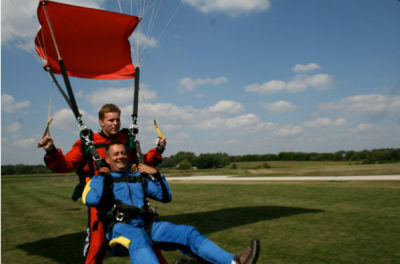 I continued packing, saving money, and went through the AFF program to become a licensed skydiver. 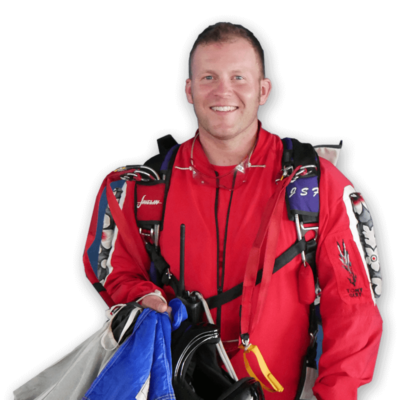 I had made enough money packing parachutes to pay for all my skydives and equipment – and to this day, I have yet to pay anything into the sport. It has paid for itself! 2.) What influenced you to actually make the phone call to make your first skydive? Well, I never really made any phone calls as I was fortunate to be invited into the sport at such a young age. However, my part in this sport would not be possible if it were not for Bo and Alex. Bo recognized my interest in the sport early on and knowing how shy and introverted I was, he pushed me out of my comfort zone and is expanding those boundaries to this day. Bo and Alex both have been in my life for such a long time that without their help, I would not be where I am in this sport today. I like to think of them as family. 3.) What’s the most memorable skydive you’ve ever been on? I few that I can list are my very first tandem jump; my first few student jumps; a tandem skydive with my sister; my first wingsuit jump; and opening my parachute at high altitude to enjoy the views. Every jump is memorable in its own unique way and one of the many reasons I love to skydive. There is not one person or thing that is my sole inspiration. I am inspired a little bit by each and every person around me. I live life trying to be as open and unbiased as possible. I take information in from all sides, both positive and negative, learn from it and do my best to apply it to my own life. Although I must say – nature and being outside has its own way of inspiring me. 5.) Of all the places you have visited – which is your favorite and why? So far the coolest place I’ve traveled to has been a jeep trail in Colorado known as ” The Alpine Loop.” It is centered in the San Juan Mountains, between Lake City and Ouray. I drove this trail with a rental Jeep through some of the most breathtaking views I’ve seen, as well as some of the steepest roads I’ve ever been on! I tend to enjoy vast open wilderness and plan on traveling much more in the future. There are many places and reasons to list but that trail really stands out. A worthy mention was the beach of the Pacific ocean in San Diego, CA. I was amazed at how deep and thunderous the crashing waves were. I’ve grown up around the Great Lakes but I have never heard anything like that before and it was a calm day! I would love to experience the giant waves of the north shore Hawaii some day. 6.) Your profile says you like to cook. Tell us more about that. What’s your favorite meal to cook? I have always enjoyed cooking because it is hands-on and you get to enjoy the fruits of your labor. I love that you can control all ingredients that go into your food and how it turns out. I love being able to pick fresh things at a local farm and turn those ingredients into something delicious (…hopefully). I don’t have one favorite food to make or eat, but at the moment I enjoy making Pad Thai and other Asian dishes. I love trying my hand at everything. I have great fun making fresh custards and ice creams as I can come up with unusual flavor combinations you just can’t get anywhere else. Some of my favorites include Lavender Honey, Lemongrass Ginger, and beer (surprisingly good). Lately, I have been homebrewing beer and wine – which is also very fun. 7.) What is something few people know about you? I love garage sales, estate sales, and auctions. The search for hidden treasures and great deals is exciting. Stuff that other people don’t want or need anymore could be something you have wanted or needed for years. It’s fun to find valuable things that sellers are unaware of and turning a profit. 8.) 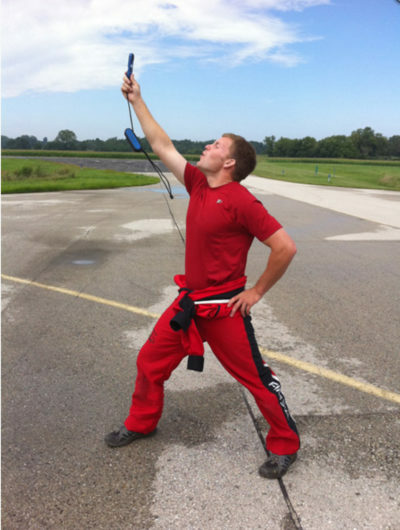 Do you have any other interests outside of skydiving? Oh heck yeah! To name a few: I love the outdoors, kayaking, mountain biking, road biking, motorcycles, rollerblading, road trips, camping, backpacking, hiking, cooking, random tinkering/mechanical projects, volleyball, and taking random things apart. 9.) What are your future goals? Right now I am in the beginning steps of pursuing my pilot’s license. I have partial color blindness and have always been told that being a pilot would not be possible. I have recently found there are ways to obtain privates and even commercial licenses while having mild color blindness. That has given me great hope and I look forward to getting things rolling in that direction.